Welcome to the One Hundred and First Edition of the Owen Guns Bulletin. Owen Guns began in 1974 in Victoria’s Mountain Country, moving to Gympie Queensland in 1980. For 41 years Owen Guns have always tried to give the best advice and the best price for the best quality to their customers. Having three staff that have engineering qualifications, that have not only gunsmithing qualifications and experience, but have also manufactured firearms is a huge bonus for customers. Combined, they have 96 years of experience in solving customers problems and don’t mind admitting they are still learning. So will keep investigating our fascinating industry. Scroll Down and click on FACEBOOK For new Free Download page. The Australian government wants our Australian Dollar to decline so that it reduces the real price in US Dollars to the overseas customers causing a hike in exports for the Mining, Tourism and Agricultural business and limiting Imports. This causes massive increases in prices as we are totally dependent on imports, we even import water. This massive increase in prices and inflation produces more taxation and the inflation will be so great it will make our countries debt look tiny in comparison with the Gross National Product figures. Always remember, Politics and Conspiracy are two words, but they mean the same. It saddens me to be the bearer of bad news, don’t like too much of this, as depression is not good for subscription numbers, but it is a duty. Many, new shooters might not know how relevant the strength of the Australian Dollar is to the Australian Firearm Industry and subsequently to themselves. 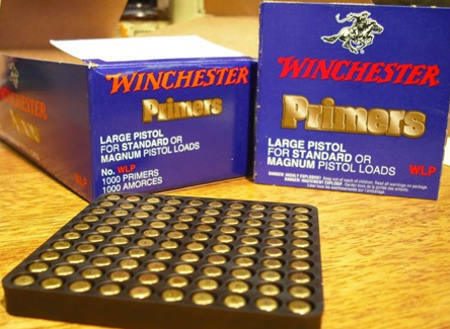 Not very long ago our Australian Dollar bought 1.05 U.S. currency so as an example, if an Australian Importer to the firearm trade, bought rifle primers that were a US. Dollar per hundred he would get 105 at that time. Today, the Australian Dollar will only buy .77 of one US. Dollar, so the importer only get 77 primers in the packet for that Australian Dollar. The people who are supposed to know in the money markets say it might go down to .66 cents within a few months. 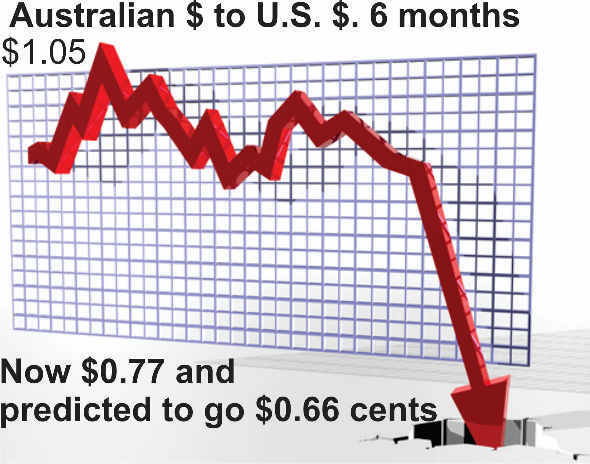 Fifteen years ago it went as low as .49 cents against the US Dollar and as you can work out ,that is only 49 primers for the Australian Dollar. As all imports of firearm products have either to be purchased with US Dollars even if they are made in China or Russia, or the goods are calculated in relationship to the US Dollar price, all the goods in Australia’ Gun Shops will increase in Price in an extremely radical way. 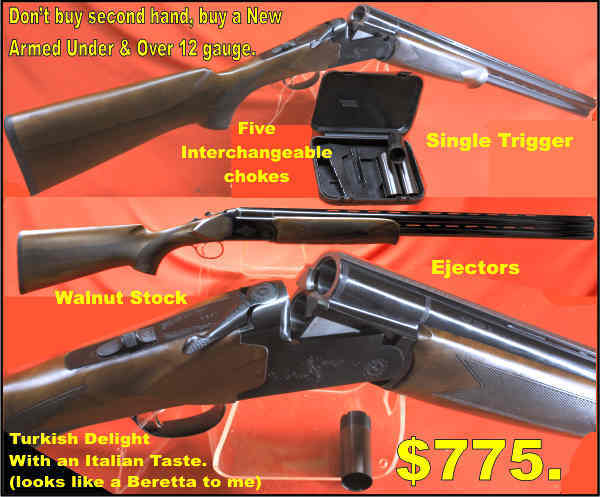 Even the minuscule amount of shooting goods made in Australia such as the new Lithgow Crossover .22 lr has imported components. Lead, Copper and Steel are sold on the world price in US Dollars, so ammunitions and components manufactured in Australia will also rise in price. Australian Dollar Decrease, Means Shooting Goods Increase. All goods imported will incur greater freight and handling rates as international freight rates are all charge in US Dollars. Landing charges are usually worked on a value percentage so they increase, Then the Importer who has to cost in factor of the money cost (interest) and the advertising, the security and storage, the freight might apply a 100 % markup on the cost in Australian Dollars so if that packet of 100 primers began at 1 US. Dollar when it was invoiced, it will cost the Australian Importer $1.298 plus 20% in freight and handling fees, then its $1.558 plus 100% for the importer/distributor margin including freight in Australia. So it lands in your local Gun Shop at $3.11. The Guns Shop margins are very competitive they do not have a 100% monopoly as do the distributors and so very often they can only apply a 10% markup that takes the packet of primers to $3.42 then he has to pay GST (Gangster/SwindlerTax) on top of that bringing his retail price to $3.77. Is it relevant to compare the price he could have originally paid if when we had parity with the Australian and US Currency and he had taken that dollar to the USA and used it to buy a packet of primers over the counter? Probably not, but this example shows what is going to happen soon to the Australian Firearm Industry. Most of the large importers are increasing their prices by 10% at the end of this month February 2015. Some have already commenced to raise their prices. Next month, or as the Importers have to pay for new stock your firearms and ammunition and accessories will increase in price. The size of these increases will depend on the amount that our dollars loses, but don’t expect them to reduce if our Australian dollar improves because large amounts of Firearm Industry products sits in warehouse stock, sometimes for years. That has to be sold and replaced by new orders at a better dollar, before there is any hope of a decline in prices. Owen Guns operates on extremely low margins, it has no rent to pay and has been in the Firearm business for 41 years. 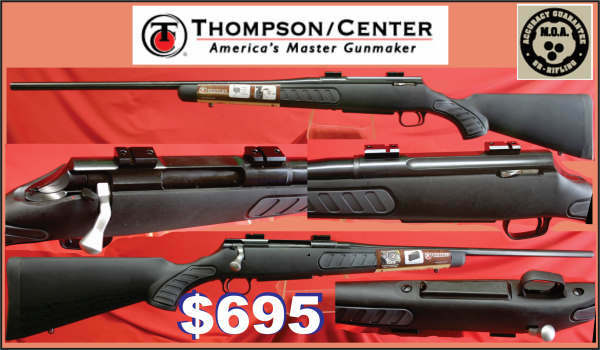 I believe they have the lowest priced firearms on market at present and they will be holding these prices until the new stock, forces them to apply the increases. 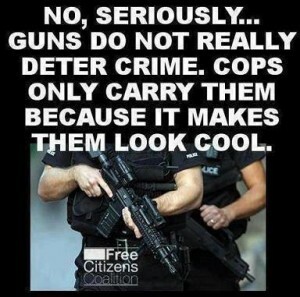 So time is short, if you contemplate buying firearms or components, do it soon, as the longer you will leave it the more expensive it will cost. 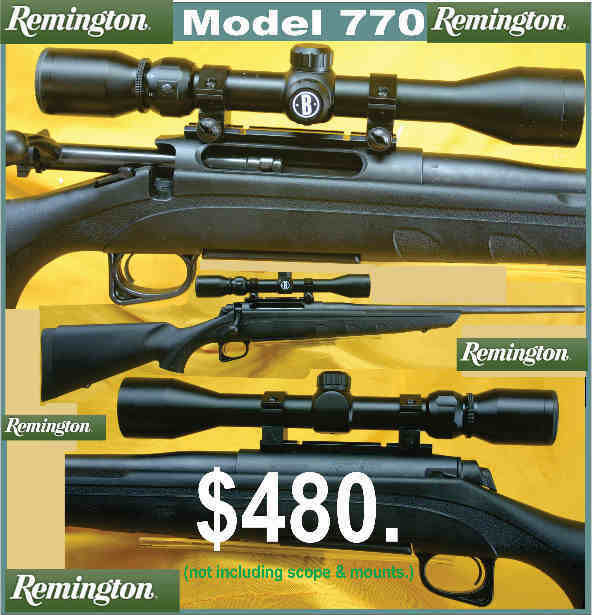 Remington Model 770 $480. (not including the scope & mounts) only .308w and 30-06spg left in stock. So if you want a new economical sporting rifle for the coming Deer season, buy today phone 07 54 825070 to ensure their is one left for you. Stainless, Walnut and Laminated are more expensive. Varmint and Super Varmint are in stock. Another Thought For The Week. Unfortunately, due to the call to a speedy election and the subsequent retirement of Member for Gympie David Gibson, he cannot speak to the petition when it is read in parliament, and at present the new parliament intentions is anyone’s guess. However, all who signed the petition are now aware that we have the “PTA wait and $34. Fine system” imposed on us. Not at the will of our politicians, not at the will of legislation, but at the will of the Queensland Police. Each of the 2200 Petitioners will receive a reply from the Police Minister that will be written by an advisor from the Queensland Police. The positives in this process, are that the policeman, (with legal training) that puts his name on this advice will have to concoct a lie, or assent to the petition and change the policy. With the change in government, that assent is highly unlikely and a lie is almost guaranteed. The new Police Minister will be asked to put his name, (and reputation) on the bottom of that letter. Once we 2200 shooters all get a copy, that give us the opportunity to expose that lie. We can email that ‘expose’ to all media outlets, to the shadow Minister of Police, to the police ‘ethical standards’ (don’t laugh too Loud, they are supposed to have them somewhere) or anywhere else, or whom ever we think may listen. This tremendous struggle we are engaged in, is not over until we win back our rights and freedoms. and to emphasise and expect the above. The Ministerial Weapons Advisory Panel (the Panel) expressed these concerns to Police Minister Dempsey, and to the credit of the Minister and his staff, his office immediately sought clarification from WLB. WLB responded that: “The change has been brought about owing to a recent decision in QCAT (Shaxson QCAT14-309) wherein it was reinforced in the final judgement that the size of the property must be substantial…”. The QCAT decision WLB are referring to said no such thing. The QCAT Member who decided that matter did not make any statements whatsoever about what size a property should be for a Category H primary production licence to be granted. There are two possible explanations for this incident. The first is that WLB have deliberately provided misleading and incorrect information to the Minister, to gain Ministerial support for a new administrative policy that they wish to pursue. The second possibility is that WLB have fundamentally misinterpreted the outcome and content of a case that was heard before QCAT, and have based their internal policy decisions and advice to the Minister on an honest, but deeply mistaken, understanding. The only remaining explanation is that WLB lack sufficient knowledge and expertise to provide accurate, credible advice to the Minister on matters relating to firearms. This suggests WLB are developing and applying policies that have no basis in fact or evidence. A Minister has the right to rely on their public servants for informed and accurate advice. In most instances, public servants work hard to ensure the quality and integrity of their advice. However, this incident raises very serious questions about whether the Police Minister can, in fact, rely on WLB to provide sound advice. It seems that, at present, policies are being developed and applied on the basis of incorrect knowledge and inaccurate assumptions. This casts significant doubt on whether the Minister can continue to trust WLB to develop and apply internal administrative policies relating to firearms management. The role of the Panel to date has been to provide expert advice on firearm-related matters, from an industry perspective. It is reasonable to expect that this is just one source of information that the Minister will take into consideration when making decisions. We would not suggest – or expect – otherwise. But these latest events suggest that the advice the Panel is able to provide is of greater accuracy and reliability than the advice WLB is able to provide. So far, the Minister has acted in good faith towards the Panel, and has always given fair hearing to the views we have put forward. Late last year, the Minister tasked the Panel and the Public Safety Business Agency (PSBA) to develop proposals for him to consider, for new and more efficient and cost-effective directions for firearms management in QLD. This is something no Minister has done before. Anything we develop will of course be commented on by WLB. This is entirely proper, but it now seems the ability of WLB to make accurate and informed judgements of any proposals the Panel may put forward must be seriously questioned. When it comes time for Ministers to make decisions, the views of their public servants are given great importance and often receive a privileged place in the decision-making process. This is usually for good reasons – public servants often hold great expertise and knowledge. But in the present situation, does this mean the Minister will give special favour to the advice of WLB, over the advice of the Panel, even though WLB’s ability to provide accurate advice has now been shown to be less than that of the Panel? What implications will that have for informed, evidence-based firearms management policy in QLD? You may also drop a copy into the Letter to the Editor, of your local paper, or share on Facebook, or other internet outlets, more importantly drop a copy into your local member of parliament so he to knows that he is being lied to. 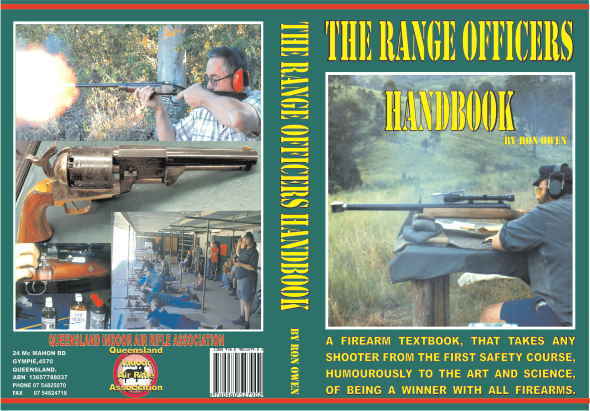 The author of the above report has rose coloured glasses as the MAP Weapons Advisory Panel, only includes shooters associations, and firearm dealers who are on friendly terms with the Queensland Police and the Police Minister, other members on the panel such as the Queensland Police Union, and the Police Minister Staff are hardly going to assist in regaining your rights and freedoms as if they did they would be quickly replaced. Some of the representatives who may have it in their hearts to protest for us, have to make the hard decision, if they speak out with the truth. Then all that will be left in the panel will be our fatal enemies. I would also like to thank the 40 subscribers to this Bulletin who put submissions into the Gympie Regional Council in support of the Corella Range Complex. It very well might make the difference in our local government recommendation, but unfortunately we might have to wait again for a change of government to resurrect the ‘Agreement in Principle’, we had from the now ex Minister Steve Dickson. It seems that the ‘Green’ opposition has succeeded in stalling us until they got a change of government. Still, it is not over, every submission, every little win in the battle is another step nearer in winning the war. Marlin Model 336 W 30-30 Win $720. (no layby) Laminated Stocks. If you want to order by mail Phone 07 54825070 have your card detail handy. To subscribe to this newsletter add your email address to the Newsletter sign up field in the right menu column. FREE FOR ELECTRONIC DOWNLOAD . Download this Book the ‘US Army Pistol Trials 1907. http://www.forgottenweapons.com/wp-content/uploads/manuals/1907pistoltrials.pdf To get more free books from Owen Guns go to Owen Guns Facebook http://www.facebook.com/OwenGunsCLICK the ‘LIKE’ button, in the top centre of the page, or the site will not interact with you. Then you can add, articles, web pages, video’s, photos etc.